“There are believed to be 9,000 to 10,000 bodies in mass graves in the community of Castile, 3,200 executed in the Burgos region. So far 154 bodies in Burgos have been identified and re-interred by family members.” These were the shocking figures revealed to me by the Families of the Assassinated and Disappeared of Burgos, with whom I met on Nov. 5, 2011, during the 3 day 75th Anniversary Commemoration of the Concentration Camp at San Pedro de Cardeña, which housed the prisoners from the International Brigades during the Spanish Civil War. The statistics soon translated into the distinct faces and heart-wrenching stories of individuals who suffered the most brutal repression and deliberate terror during the Franco years of fascist dictatorship. They not only became individuals, but warm friends and even family, as we acknowledged the common humanity and ideals that bound the International Brigades and the Spanish people across 75 years in their common struggle against fascism and social injustice. 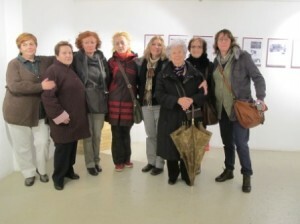 The conference opened on Friday evening with a Francoist documentary, Prisoners of War. Luis Castro, the highly regarded professor of history at Salamanca and author of the book Burgos: Capital of the Crusade and Nacho García, author of the blog Jaily News, supplied a more factual account of the situation in Burgos from 1936-1939 and of the San Pedro de Cardeña concentration camp, which was in sharp contrast to the idyllic conditions depicted in the introductory film. Nacho named the blog The Jaily News after the underground newspaper published by the prisoners at San Pedro, which was an example to him of the “discipline, self respect and morale” of the prisoners. One of the aims of his blog is to expose the existence of the concentration camp, which was and continues to be “hidden by yesterdays’ and todays’ political authorities.” That evening, the 200 seat trade union hall was literally filled to capacity by people of all ages, including the organizing committee for the Tribute. 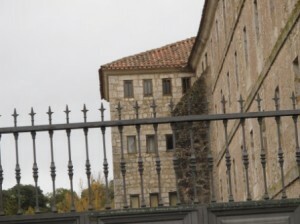 The efforts they had put into unearthing the painful history of the monastery’s role as a prison testified to the enduring power of the example of the International Brigades. On Saturday morning we visited the mass graves of former International Brigade prisoners and Spaniards, located inside the cemetery of the restored monastery of San Pedro de Cardeña. The family members of the CMRH and I placed wreaths in the colors of the Republic alongside the graves. I couldn’t help thinking during the tour that followed how the pristinely restored scriptorium, gleaming marble passageways and highly polished 15th century wooden pews contrasted with the filthy cells the prisoners had endured. San Pedro, which is several kilometers higher in elevation than the city of Burgos, exhibited its characteristically bitter and cold winds for our visit. Nacho pointed out how my father and the other prisoners must have frozen in their rags, even as we found it cold dressed in our woolen scarves and warm jackets. We went on to the trade union hall to see the exhibit of letters, photographs, music and brief biographies of the international prisoners. This exhibit had opened on October 24th to considerable local press coverage, and was extended a week beyond November 6th for a span of 3 weeks. This well researched and documented exhibition about this little known aspect of the war would be well worth circulating at more venues. I was glad to learn there are plans to compile the material into a booklet based on the show. Carl Geiser’s Prisoner’s of the Good Fight served as one of the primary sources of material. Irish Brigadista Bob Doyle’s writings and speeches were another inspiration. At the exhibit, we got our first look at the monument “Roots of Memory,” especially created for this tribute by local sculptor Susana Rioseras. It is presently in mobile form, in order to be transported on Sunday to the dedication at the monastery. When official permission is secured it will be permanently installed on the lawn outside San Pedro, facing the statue of El Cid on the opposite side. An organic form, a branch or perhaps root, whose fragility suggests the passage of time, sits atop stone panels. The panels are inscribed with the various points of national origin of the prisoners, alongside figures indicating how far they had traveled from their respective homes. As one read “New York 5695 km…Buenos Aires 10,029 km…Habana 7,440 km,” it was very much in evidence that the internationalism and antifascism of the Brigades were traveling still through Susana’s artistry. The exhibit also includes material on the Italian prisoners of the Republic, whose exchange saved the Brigadistas from the fate of the on the spot executions which they had fully expected when captured. I was glad to supply a photo of my father and other veterans in WWII uniform holding placards from the American Committee for Spanish Freedom reading “Break With Fascist Spain.” This example of the continued activism of the Lincolns elicited a strong reaction at the gallery. 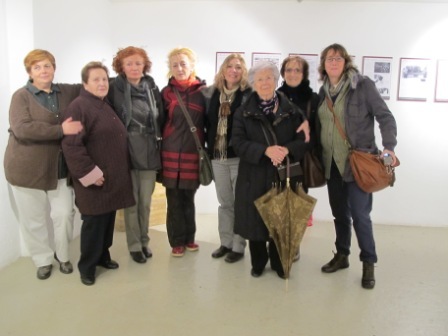 I was humbled by the warm embraces of the Family Members of the Assassinated in Burgos, who gathered around the biographical sketch of my father to learn more about my own family. 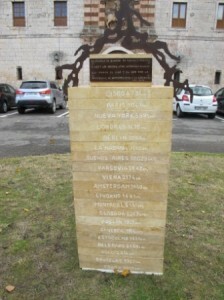 The weekend’s events culminated in the Tribute on November 6th held outside the monastery at San Pedro, site of the former concentration camp. Even the rain seemed to reflect the spirit of cooperation that defined the day, stopping just long enough for the duration of the program. The first speaker, Luis Castro, cited the address of former Irish battalion prisoner Bob Doyle during his visit in 1996. Doyle had stated that the sacrifice of his comrades for the noblest of causes, the freedom of all humanity, was not in vain. AABI Vice President Vicente expressed his support for the work of the Committee for the Recuperation of Historical Memory in Burgos, whose work is now jeopardized by imminent budget cuts. We then heard poignant first hand accounts of the repression in Burgos from family members themselves, some of whom visit local schools with workbooks and documentation. A prominent competative [chess] player in the Uited States, [who] gave a series of lectures and played over famous games from the past. To hear him talking – in our squalid surroundings – with such knowledge about a game once played Napoleon on the island of St. Helena, was an uplifting and inspiring experience. Thank you for sharing that Richard. I did not know my father was mentioned in George Wheeler’s memoir. I love the title. Is “To Make the People Smile Again” still in print? My father was in this concentration camp in 1939, Is there a list of prisoners or any other information available.